Finish : protective textured finish with a wide range of features for Exterior and interior surfaces. Application : Durability: Pure Acrylic base ensures more durability. Coverage: More percentage of Prime Pigments adds to more coverage. 7 sq. metre per coat/per ltr.3.75 sq. metre/per lit. for double coat on non absorbent smooth surface. Economical: Approx. 40 sq.ft. per lit. in 2 coats. @Rs.95.00 per lit.,it costs Rs. 2.38 per sq.ft. Flexibility: Based on thermo Plastic Resin, it effectively takes on natural surface movements. Freshly Painted Look: Special Light Fast Pigments & U.V.Resistant Resin ensures a freshly painted look of the coating. High Abrasion Resistant: Hardest known fine breathes out trapped moisture. Easy Application: A most easy process of application. Covering Capacity : Super Fine: 8 Sq Ft. Per Kg. 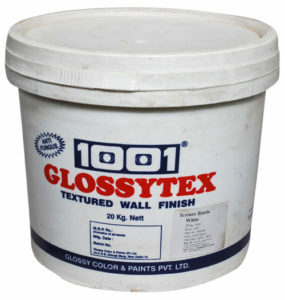 Application areas : GLOSSYTEX has been successfully used on concrete surfaces. Hardboard, Asbestos sheets.Gypsum board & ply etc.